Natalie Belfiglio December Volunteer of the Year! Natalie is the two time volunteer of the month for Unselfish and Congeniality. Natalie joined our family one year ago as a Public Relation intern and is an integral part of our Marketing team. Natalie’s enthusiasm makes our day brighter. She selflessly gave up her summer break after graduating, and jumped at the opportunity to extend her internship into the summer to help out in the Marketing Department. Natalie played an important role in sharing the story of Victoria the penguin, getting pictures of her in the “spa bath” behind the scenes, as well as pictures of Dan and Jolene taking care of her. Those pictures, and Victoria’s story, made front page news in the newspaper. Natalie is the embodiment of Congeniality. Natalie is positive and always smiling. We’re lucky to have her – our own Miss Congeniality! Congratulations Natalie! Natalie is the embodiment of Congeniality. She is warm, friendly and approachable. I can’t tell you how many times she’s gone back to the Vet Lab or behind the scenes to track down a biologist to ask them questions while putting together a social media post or a blog post. Natalie is positive and always smiling. A recent example of her energy and spirit is when she came in (on a day she wasn’t normally scheduled) for the Scuba Santa Passholder Preview, and helped greet guests at the door. Natalie created her own elf costume to be part of the festive night. She hung out in the theater and talked to Scuba Santa. By coming in on her day off, she made our day better, and really helped out when we were short staffed! Natalie is kindhearted and is always looking for a way to help us out in the Marketing Department – whether it’s stuffing envelopes, creating media kits, or greeting everyone who walks down the hall or past our door, she really does make our day better. We’re lucky to have her – our own Miss Congeniality! Erin Holtman has volunteered with WAVE for about a year now and her commitment has never wavered. She continues to seek new programs and skills to improve her own abilities as a volunteer. Erin not only learns quickly on programming, but she offers suggestions and ideas to improve the programming she is passionate about. She has taken on many of our conservation messages and brought them to the restaurant where she works in order to make that organization more environmentally friendly. She began a recycling program, made straws available by request only, and now provides water bottles for staff use instead of single-use plastic cups! Thank you Erin for continuing to be an agent of change for conservation. Rob joined our family in the spring of 2017 as a diver, and has donated over 450 hours of his time. If the dive team needs extra help Rob is always the first one to contact us to help out. There have been several dozen times (literally) that Rob has really helped out the dive team- especially during Mermaid and Scuba Santa Seasons. He is always willing to go above and beyond- “anything to help out the team”. He definitely makes our day being here. Robs actions are a true example of what a team player should be! Joyce joined our family in 2015. She is amazing! She self-schedules based on the season and the number of requests we receive. She will schedule extra during peak season to make sure all requests are fulfilled in a timely manner. I never have to worry about it getting done, because Joyce is on top of it. Joyce fulfills about 200 requests each month and has fulfilled over 6,500 requests since she started in November, 2015. Joyce now has a new grand baby that she will watch during the day while her daughter works. Joyce is so dedicated to the donation program, that she is willing to taking late afternoon or weekend shifts to make sure everything is completed. Thank you Joyce for all of your dedication! 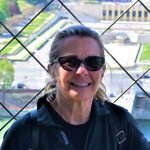 Kathy Dye joined our Aquarium family in 2001 as a volunteer diver and has served several years on our Board of Directors. Kathy has volunteered over 2,000 hours. She is always truthful when working with WAVE staff, Newport Aquarium employees and other volunteers and interns. Through her truthfulness she gives us all perspective and makes us better. Being truthful can be difficult at times but Kathy always delivers news good or bad in a palatable, constructive and meaningful way! This is Kathy’s third time as Volunteer of the Month. Thank you Kathy for all you do! 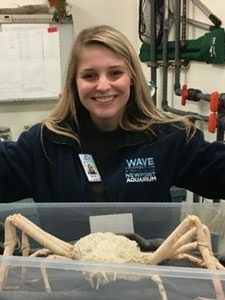 Jane joined our Aquarium family as a volunteer in December of 2017. She is no stranger to WAVE Foundation and Newport Aquarium. Her children Allison and Matt Sparling were also volunteers and interns with us. Jane came on in the Education department to volunteer with our Career Exploration Initiative but communication, scheduling, and training meant that she did not start volunteering for 6 months. Jane never gave up on her commitment to the program and volunteering. She has now come in to help with multiple programs and volunteered her time at Putt for Penguins. Jane is enthusiastic and willing to help in any way she can with no complaints or hesitation. Thank you Jane for your dedication to WAVE and our Aquarium. Natalie’s enthusiasm makes our day brighter. She’s been an amazing PR intern. She selflessly gave up her summer break after graduating, and jumped at the opportunity to extend her internship into the summer to help out in the Marketing Department. As a PR intern, she takes the initiative to help share stories about the amazing work happening in this building. Natalie played an important role in sharing the story of Victoria the penguin, getting pictures of her in the “spa bath” behind the scenes, as well as pictures of Dan and Jolene taking care of her. Natalie is always willing to pitch, stay late, and do things that help the team achieve goals and deadlines. She selflessly came in on a Sunday and worked until midnight, helping out on the TV shoot for Ring of Fire. Her positivity is contagious, and a common phrase she says is “I’ll help!” We were so fortunate to have Natalie as an intern this past semester, and even more lucky that she stayed on to continue volunteering through the summer. 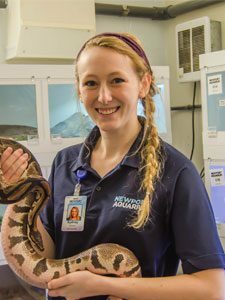 It’s amazing to see a recent college graduate give up their summer because they want to continue to get the experience here, and help Newport Aquarium be the best we can be. Thank you, Natalie, for always sharing your smile, and coming in with a can-do attitude each and every day! Sophie has been amazing to work with this semester. I trust her implicitly as there has not been a task that I have assigned her that she has not done an excellent job with. She is thorough in the content, precise in her work and has been prompt. She has done a number of market segmentation studies for WAVE and our two largest fundraisers, Putt for Penguins and Nauti Nite. In fact, her work has already netted us a new Par sponsor for our annual golf outing. Her attention to detail is impeccable and willingness to take on new and challenging tasks has been an incredible asset to WAVE Foundation! Thank you for all of your time and dedication and most of all being trusting. Sydney Pitts has been with WAVE Foundation since 2015 when she joined our family as a Summer Naturalist. The moment you meet Sydney, you see genuineness in her that makes her special. As you get to know her you realize she is not only pleasant & easy to work with but she is very competent, dependable, and trustworthy. I have run into Sydney on days when she is working here filling in for other departments she was not originally hired for. She is always lending a hand to other volunteers as well. The title humble so perfectly suits her in her attitude, work ethic, knowledge and relationships. We are so lucky to have Sydney. Thank you for all of your time and dedication and most of all being humble. Krista Sprague joined our Aquarium family in 2014. She consistently displays a good and kindhearted nature when interacting with guests. Whenever Krista is on an outreach, she engages kids on their level and makes it a point to answer any questions or help them understand an artifact further. Krista is constantly smiling no matter where or what she is doing. She smiles a lot while on outreaches and while she is helping Jen Hazeres with her husbandry work. Krista is always quick to volunteer when we are in need of help and brings her kindness with her! We appreciate everything Krista does! Jay Dearth joined the Aquarium family 10 years ago and has been a stellar strength here at WAVE. The husbandry team recently needed to have overnight behavioral observations done on the new stingray exhibit. Jay immediately answered our call for help and showed patience as created process. He offered to come in almost every night to do the observations. His good and kindhearted nature has been much appreciated by the husbandry team and everyone at the Aquarium. Jay is never demanding and is uncomplaining. He makes sure that he understands what is being asked of him and gets every detail before starting a task. He appreciates the challenges and responsibilities the husbandry team has with readiness. Jay works his hardest, and this strong work ethic helps everyone be successful. Jay also volunteers for WAVE fundraising events and is one of our volunteer divers. We cannot think of a more worthy and patient volunteer than Jay Dearth. Congratulations to our 2017 Volunteer of the Year! Larry Flinner has been an amazing asset and a blessing here at WAVE. He literally gives his time, effort and energy to multiple education programs. He helps WAVE with: WAVE on Wheels outreach programs, teaching Finstitute classes, educating NAQ guests at the Discovery Station, and campers with his trips from all around the world! He has recorded the work we do in our community and helped us tell our story. Larry does this with authenticity, reliability and truthfulness. He always makes us smile. He always comes in and makes a joke or has a great story to tell. He is a person you want to be around. He shows us his heart every day when he comes into help us out. Larry is the definition of “unselfish”. This trait can be hard to find this day and age and his perspective and willingness to talk with truthfulness encourages our goal of continuous improvement. Larry is an incredible educator who always makes time for us when we need him. 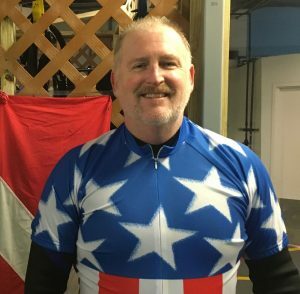 We can’t think of a more deserving volunteer than Larry Flinner. Jeff Denhham is a volunteer in husbandry and is nominated by Jen Hazeres. Jen said she immediately thought of Jeff for the Volunteer of the Month – Patience. She stated that he is very dedicated as a volunteer here at the Aquarium. Jeff travels two hours one-way every Wednesday to volunteer in husbandry. In his five years, Jeff has been through several interns and each time he seems genuinely patient to allow each of the interns to learn and take the wheel when he is working with them, and watch while they are learning all the details. Jen really appreciates everything Jeff does for her and the Aquarium and his patience of working with others. 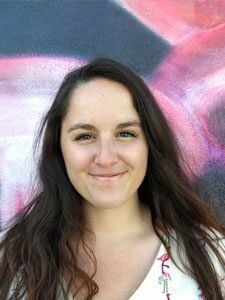 Tori Liles is one of our education interns at the WAVE Foundation. Not only is she a great educator but she is excellent help with the animals. Tori is wonderful and kind when talking to students and teachers during school visits. On a recent outreach during the shark cart presentation, the kindergarten students were all very nervous to touch the sharks, but Tori talked each one through the process from feeling the water to finally touching the sharks. By taking the time to do this, each student was able to see how safe and amazing the sharks are. Tori’s kindness helped make the students’ experience worthwhile, which is what made her the perfect candidate for the kindness award. Alle Barber is one of our husbandry interns at the WAVE Foundation. Alle is very kind hearted and humbly goes throughout her day without calling attention to herself. Alle is always doing so much for others and never asks or expect things in return. She never blinks an eye at helping others and does not require praise or feedback on her performance. Alle shows respect and is courteous to all who she meets. Being a selfless co-worker and a wonderful volunteer is why Alle was chosen as our “Humble” Volunteer of the Month. Melanie has been a tremendous help in the Marketing Department as a PR volunteer. She has taken on projects for some of our biggest campaigns, all while making our days better. Melanie put together two dozen media kits for our Shark Bridge announcement for the 2-millionth crossing. I knew I could trust her in gathering the items and assembling the media kits. She also created a social media campaign surrounding the 2-millionth crossing, as well as gathered pictures to help promote the crossing. Melanie also produced a campaign to help promote Newport Aquarium’s nomination for USA Today’s 10 Best Aquariums. She often takes the initiative to create content that we post on social media, and the Newport Aquarium blog – and she does so in a kindhearted nature. This is what makes Melanie a great candidate for April’s “Trusting” Volunteer of the Month. Congratulations to Kathy Dye, a volunteer diver and WAVE Foundation Board Member, who shows great characteristics of being unselfish. She is always willing to lend a hand when needed as a diver or Board Member. She is also willing to reach beyond the glass & give the guests a memory worth repeating. Kathy was in the Tide Pool area cleaning one of the exhibits, when a little girl came up to the glass & wanted to see her, Kathy showed what it takes to be unselfish & took time out of cleaning to play with the little girl & her mom. She easily could have just waved & continued to clean, but she wanted to make a memory worth repeating. When the guests when home they wanted to thank Kathy, so the young girl wrote a thank you note & sent it to the Dive Safety Officers to pass along. Thank you Diver Kathy for showing how easy it is to be unselfish when in a working environment & how easy it is to think of others and to make a memory worth repeating. Congratulations to Kristen Guevara, a cast member and husbandry volunteer. Kristen recently took time out of her busy morning volunteering to demonstrate what she does as volunteer, permitting photographs of her feeding seahorses and cleaning tanks for a Takeover Tuesday. A perfect example of Kristen’s forgiving nature is that same morning she was asked if she could help Exhibits and fill in to help with a Penguin Sunrise due to the cast being unexpectedly short-handed. Without hesitation, Kristen immediately called Laurel to let her know, and worked out a plan to finish her duties before 10 so that she could do the Sunrise. And she did! Kristen did so in such a kind hearted and positive manner, and did not dwell on the fact that someone had called in, changing her plans for the morning. By simply saying yes and looking for how she could help, she made so many people’s day better that morning – including cast and all the guests who attended the Penguin Sunrise. Maryann has been an excellent addition to the conservation education department at WAVE. She constantly displays a good kindhearted nature when she is helping others. For example, at Riversweep she came in early and stayed late making sure everything was set and ready to go. She greeted volunteers at the registration table with a cute puppy and a smile! She did not mind getting dirty and then immediately showered and took a group on a BTS tour. No matter what is asked of her, she does it with a genuine happiness that is absolutely contagious. Also, with her current intern project, she has been asked and gives truthful, honest feedback on all WAVE work. If she believes her idea will help our department, she is open and truthful about her opinion, which we value very much. Thanks Maryann for all the you do for us! 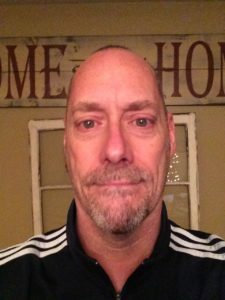 Join us in congratulating our August Volunteer of the Month, Chip Wehmer! The August theme is dedication. Chip has been our volunteer diver since 2000! He has been a volunteer diver for 17 years and has over 1,500 hours which we believe makes him a dedicated volunteer. He consistently shows up at least 2 times a month. He is always willing to work hard and go beyond his normal tasks. Chip really shines when he is helping to take less experienced volunteers to dive in the shark tank. After 17 years, Chip volunteers regularly and approaches each day with a smile and positive attitude, this is why we nominated Chip! Libby has been an integral part of WAVE’s recent successes. Even though she will refuse to take any credit, she has been an incredible team player and leader for our Foundation. Years ago, when the pitch was made to focus on expanding our outreach program, most of the board members resisted the idea. Libby was the biggest supporter, argued, and fought for the increased focus and attention on the outreach program. Without her support and willingness to go against the grain, WAVE Foundation would not be in its current positon of impacting over 60,000 community members each year! Whenever I have needed anything from Libby, she has always been there to listen, offer advice and support us in making our dreams become a reality. Libby is the definition of what it means to be a TEAM PLAYER. Sam started as a Jr. Camp Counselor in 2014 with WAVE Foundation. He went away to school and when he came back, Sam began volunteering in our animal care. He has shown his innovation in his implementation of enrichment for our reptile collection. Sam has created various enrichment items that have improved our animal’s lives and has a drive to keep creating more. He has worked closely with our herp team to find the best way to create these items efficiently with materials we already have in house. Help us congratulate Dr. Jerry Carpenter for the Congeniality Award. Dr. Carpenter is a special volunteer; he is a teacher, a mentor, a coach, a father and a steward of good feeling. He has taught and inspired many of the current and past biologists at the Newport Aquarium. Even after his retirement from Science Chair at NKU, he has stayed involved in personal experiments to identify new and rare species. That is amazing on its own but unlike most researchers he shares his expeditions and his successes with students. Dr. Carpenter is always teaching, always listening, always positive. He is an inspiration to us all as a scientist, as a teacher and as a conservationist. In October of 2015, WAVE had a request for a penguin outreach to Kingsport, TN. I said “definitely”…without giving much thought to the 2nd person that I would need to drag on a 13 hour outreach! In early November, I was on an outreach with Shannon Smith and mentioned to the library guests that I was even taking a penguin to Tennessee. After the outreach, Shannon said to me; “I want to go on that outreach!” I asked her if she was sure she wanted to spend a whole Friday in the van driving to and from…and without hesitation she said she was definitely going to Tennessee as WAVE is making history! On December 18th at 6am, we packed up Blueberry and took a 13 hour round trip to Tennessee. We also stopped by Virginia to get a great picture with our van and the state sign. We had an incredible outreach and were truly doing something WAVE has never done before and Shannon was a big part of it. I am nominating her for volunteer of the month because Shannon absolutely goes above and beyond what is asked of volunteers! She always says “yes” and enjoys meeting with crowds on outreaches. 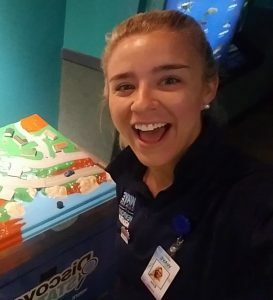 Alyssa joined our Aquarium family in March of 2015 as a Summer Naturalist and hasn’t stopped since! She has donated over 240 hours as a Summer Naturalist and recently hit her 300-hour milestone! While volunteering, Alyssa treated a group of special needs students from her school to a day at the Aquarium. She used the tickets that she earned from volunteering during the summer to treat them. Wanting to provide the best experience for her group, Alyssa went a step further and created a scavenger hunt worksheet for them. She is a real star performer for us in every way. This particular occasion showed that Alyssa undeniably deserves a nod for Volunteer Of the Month. Kathy Dye joined our Aquarium family in 2001 as a Diver. She wears many hats here at the Aquarium. She is not only a diver but also one of WAVE Foundatnions Board of Directors. She has donated over 1500 hours of service here. Kathy’s attitude and work ethic are not only stellar but contagious! She is always ready to help in any way and loves to interact with the guests. She is such an asset to me and the rest of our staff. Kathy responds to every task with a big smile, willing attitude, and great sense of humor. She is an incredible person and volunteer!!!! Toni joined our family in March 2008 as an Exhibit Interpreter. From there she has jumped in whenever someone has needed help in either the Discovery Station, assisting with special events, being the filing specialist in the VSO, and even helping out with outreaches. She is always willing to lend a helping hand and just by talking to her for a few minutes you will discover the great love and care she has for all animals. Her stories are endless, fascinating, and will keep you glued to your chair just listening to how experienced and knowledgeable she is at what she does. Toni is always friendly and patient everywhere she goes. She has a smile for everyone, from the very young to the very old. Her winning personality is only part of what makes her so awesome. Toni has volunteered over 6,500 hours of her time to numerous organizations! 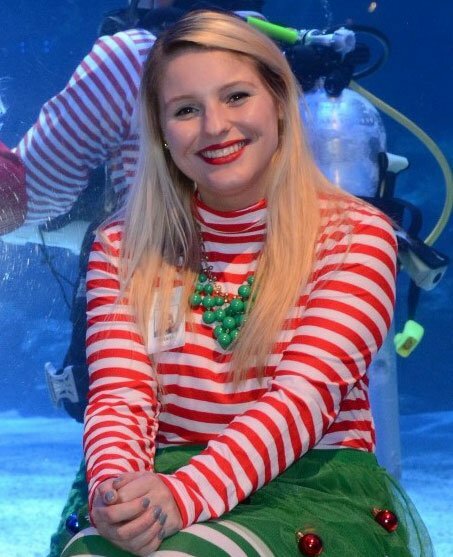 She really provides that extra special something to every guest that asks her a question, and she really deserves to be recognized this year for her outstanding volunteer work that she contributes to the WAVE Foundation and Newport Aquarium!WORTH REPEATING!! Jon joined our Aquarium family in 2012 and this is his third time being nominated for Volunteer of the Month. When guests see divers in the water, they go crazy and always want a picture with them. Jon is a true rock star for the dive team. One time when Jon was in the shark tank he found a large sand tiger shark tooth. As he was continuing along the dive he saw a little boy in the bubble window. He and his safety diver went over to the window to make a memory worth repeating. Jon showed off this new sand tiger’s tooth he found with the little boy. Jon noticed that the boy was very excited to see the tooth and was trying to talk with him, but it is kinda hard to hear through the glass. Once the dive was over, Jon rushed to get cleaned up and went straight down stairs to the shark tank to find the boy. He wasn’t there, so Jon rushed up to the gift shop where he saw the boy looking at shark teeth necklaces. Jon went over to the boy and gave him the tooth he found and talked to him about sharks. This is one one example of why Jon has been nominated for Volunteer of the Month. THANKS JON FOR MAKING MEMORIES WORTH REPEATING!! Being a volunteer diver means more than just helping out at the aquarium for these two volunteer divers. Bryan and Danny helped the DSO team when we brought on a new group of twenty new volunteer divers. Both of these guys used their dive master skills to help monitor and assist the new divers as they went through skills and swim test. Both of them took it upon themselves to make sure everyone was safe and still having fun while they went through the assessment. Not only did these two divers help with the assessment, but they have helped train some of those new volunteer divers in the exhibits here at the aquarium. To the credit of Danny and Bryan, some of the new divers approached the DSO’s and told us how much they appreciated their help, not only in the pool, but here at the aquarium as well. Give Tori a big high five when you see her, because she’s our Volunteer of the Month! She traveled to DC with us and documented the entire, historical trip for WAVE. Her work will no doubt propel our Foundation into the future and expand our virtual audience! She already has made a huge impact on the future of our website and how we communicate to our constituents. Tori is active and looking for new ways to help the WAVE Foundation progress into the future. She is always ready and willing to help express our love for the aquatic life with the world through her lens! As a videographer intern, she has helped multiple departments with her skills and ideas. Tori is definitely creating memories worth repeating! When volunteer divers come to the aquaruim to dive, they trust the DSO’s to provide not only knowledge of SCUBA, but to keep them safe while they dive. Kevin Taylor has always had his eye on safety, even when he is not diving. He has donated the cut resistant gloves we now use in our Coral Reef exhibit. The DSO’s like these gloves so much that we have decided to use them as maintenance gloves as well. Not only did Kevin think about divers, he thought about the husbandyr staff and the penguins. He has also donated cur resistant arm bands to help keep the husbandry staff safew when they deal with the penguins. Kevin has not helped keep all the divers and husbandry staff safe and this is why he was nominated as Volunteer of the Month. Thank you Kevin for keeping us safe!! Marc Kuhnhein always goes above and beyond for the dive program! Lately, Marc has been asked to do some pretty out of the ordinary tasks. Whether he is asked to use the force or catch fish (with a net in each hand in a dry suit—talk about excellent buoyancy! ), he does it with a smile on their face! He checks in with the dive office to see if he can help out (almost on a weekly basis) in Pacific Coast—the coldest tank our divers get into. Marc always has a “What can I do next?” outlook when it comes to helping! Not only can you find Marc underwater around the Aquarium, but you can find him helping out at other WAVE Events (most recently Putt for Penguins). Marc’s efforts and dedication truly makes the Newport Aquarium a great place for great people! Gil has gone above and beyond in his role as a PR Video Production intern here at the Aquarium. He has a vision and sees it through from start to finish. A perfect example this month, he came to us with an idea to create an “Office” type satirical video about Mermaids. His idea: a Day in the life of a Mermaid. He wrote a script, we reviewed it, he cast his actors, chose the scenes, and coordinated the shoot dates. He shot the video, and worked with “Calliope” the mermaid, as well as NAQ cast members. Gil leads with love, and is truly passionate about working here. You can see that passion in the videos he creates and stories he tells. The video turned out phenomenal! We posted it on YouTube and Facebook, and it’s on track to be our most popular post on Facebook this year! 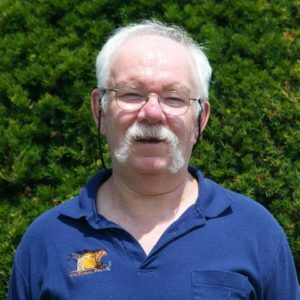 A true volunteer, with a dedication to perfecting his craft, Gil devotes countless hours afterhours – when he finishes editing and assembling each video production he works on. We are so fortunate to have Gil’s talents here. He is such a professionalism, and a pleasure to work with! 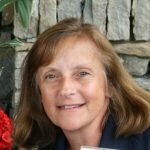 Kathy Folk is Volunteer of the Month for December. Kathy’s enthusiasm is absolutely contagious! She is always happy to be at the Newport Aquarium, no matter the task- when asked to do something she usually responds with “I’m just happy to be here!”. She eagerly shares her passion with others. Recently, after completing a dive show, she didn’t hesitate to talk to the children all about scuba diving. She had the campers captivated as she explains some of the things she does here and the mechanics of scuba diving—completely engaging them and inspiring the next generation of divers. 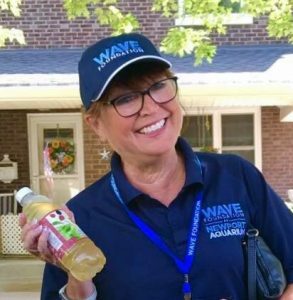 Not only can you find Kathy underwater, but you can also find her helping out at other WAVE Foundation events. Thank you Kathy for helping other experience the wonder! Congratulations to our 2016 Volunteer of the Year! Toni joined our family in March 2008 as an Exhibit Interpreter. From there she has jumped in whenever someone has needed help in either the Discovery Station, assisting with special events, being the filing specialist in the VSO, and even helping out with outreaches. She is always willing to lend a helping hand and just by talking to her for a few minutes you will discover the great love and care she has for all animals. Her stories are endless, fascinating, and will keep you glued to your chair just listening to how experienced and knowledgeable she is at what she does. Toni is always friendly and patient everywhere she goes. She has a smile for everyone, from the very young to the very old. Her winning personality is only part of what makes her so awesome. Toni has volunteered over 6,500 hours of her time to numerous organizations! 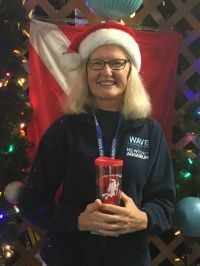 She really provides that extra special something to every guest that asks her a question, and she really deserves to be recognized this year for her outstanding volunteer work that she contributes to the WAVE Foundation and Newport Aquarium! Thank you Toni for all you do! The VOLUNTEER OF THE MONTH Award is our symbol of achievement, recognizing special service to our guests and each other. The VOLUNTEER OF THE MONTH Award Program offers every member of the team the opportunity to say “Thank You” in a visible, personal way. The pursuit of excellence does not end with achievement. It begins there. The VOLUNTEER OF THE MONTH Award Program celebrates the exceptional service that we are striving to provide every day in all our dealings with guests and each other. 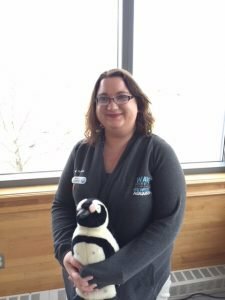 You don’t have to be a volunteer or employee at Newport Aquarium in order to nominate someone for Volunteer of the Month. If you have seen a volunteer go above and beyond the call of duty and you think they deserve recognition, click below to download the Volunteer of the Month Nomination Form, fill it out, and email to volunteer@wavefoundation.org.